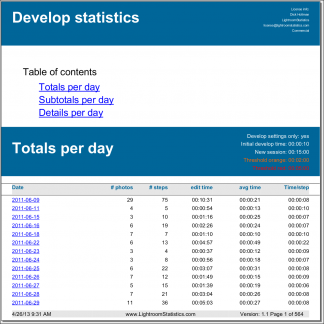 How much time do you spend on your images? Calculate the estimated costs of the develop work. From import up to this moment, see all the history of the selected photos and the time you spend on them. Are you productive? How much time do you spend on the average on an image? 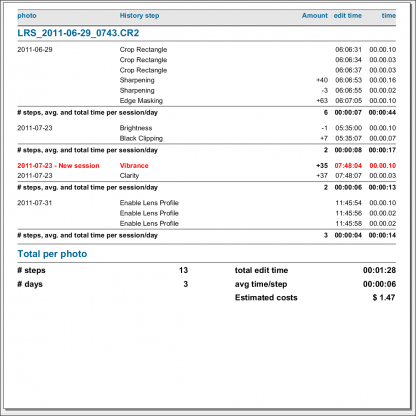 Is the price you ask for your photos in balance with the time you spend on taking and editing them? Curious and want to know more? Download the free sample. 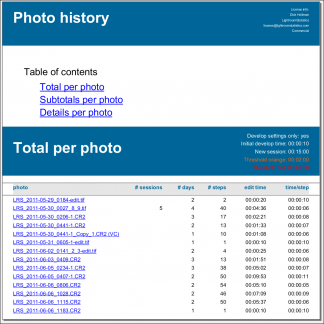 From import to export, this report shows the life-cycle for all the photos in Quick Collection. It reports the date and time of import, of all the adjustments you made and all the exports and publish actions. When and how long have I worked on this photo / these photos? Read below which statistics are calculated for you. When did I made that export for my client? When was it uploaded to Flickr? With a parameter you can select to see only the development adjustments, and so exclude the import, export, publishing steps etc. Only the photos in Quick Collection are reported. This because otherwise one could get a report for his whole Lightroom catalog, which can easily contain 100.000 pictures. The report is split in three sections. 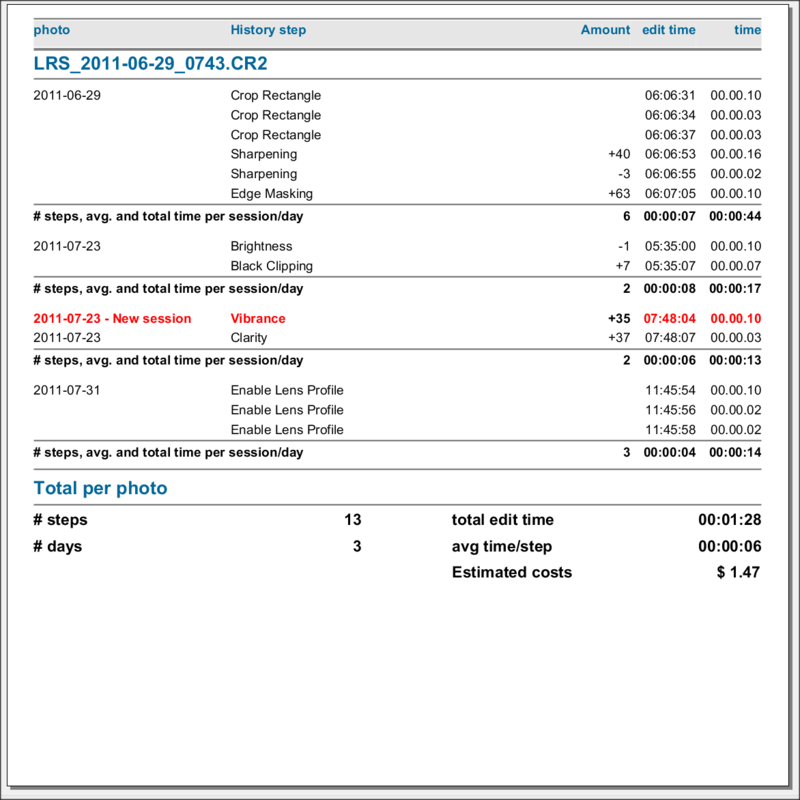 First a summary, then subtotals per photo/day, then detailed info of each adjustment you made. When the time between two adjustment steps exceeds the value of the parameter orange or red, then this step in written in that color. See the parameter tab. Although Photo history and Develop statistics are much alike, the main difference between them is that the first is ordered by photo and then time while the second is ordered in time. 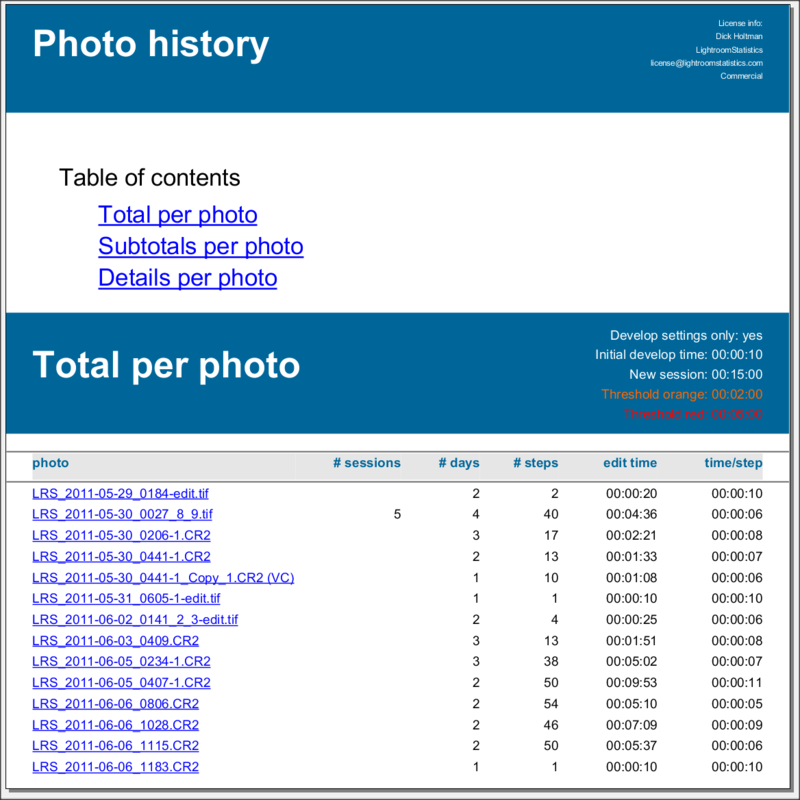 Photo history shows for each photo all history (import, adjustments, exports, publish …) in time. You can see what happened when to which photo? What have I worked on in a specified period and how much time did this take? Although you can run this report against your entire Lightroom catalog, this report is meant to be used on a set of photos you want to analyze. 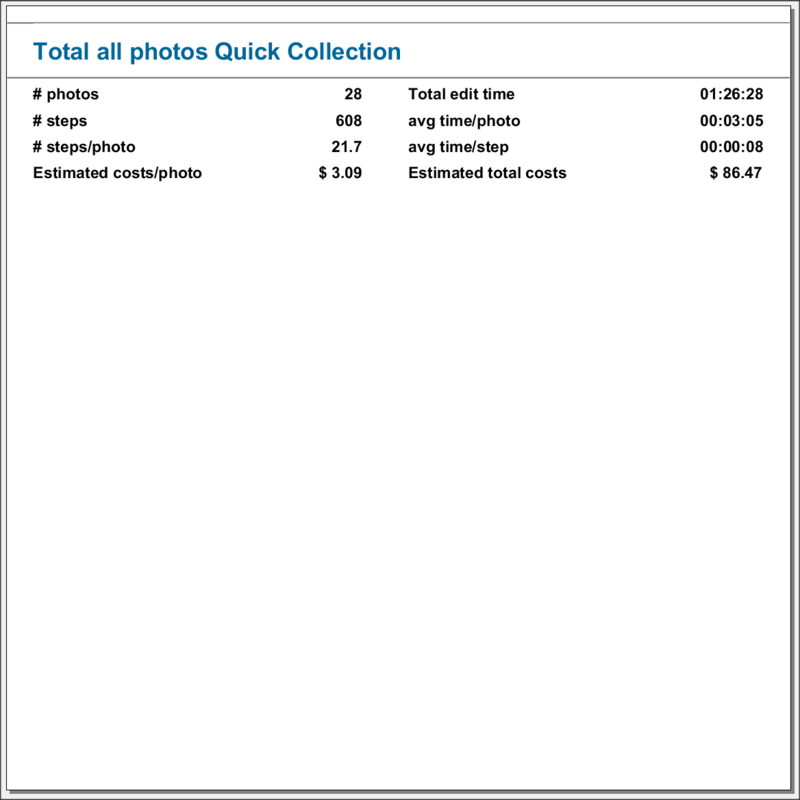 That is why it reports on photos in your Quick Collection. Default this report is limited to approximately 1000 pages, see parameter “Limit report size”. 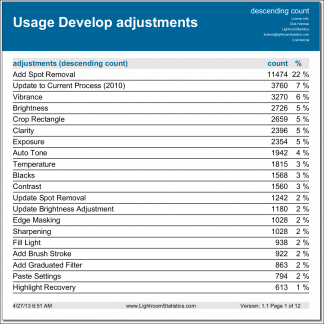 Description With “Only development adjustments” the Import, Exports, Publish, Reset settings, Print, From metadata history steps are excluded from the report. This means default all history is reported. All import, export, publishing, printing etc. steps are listed. 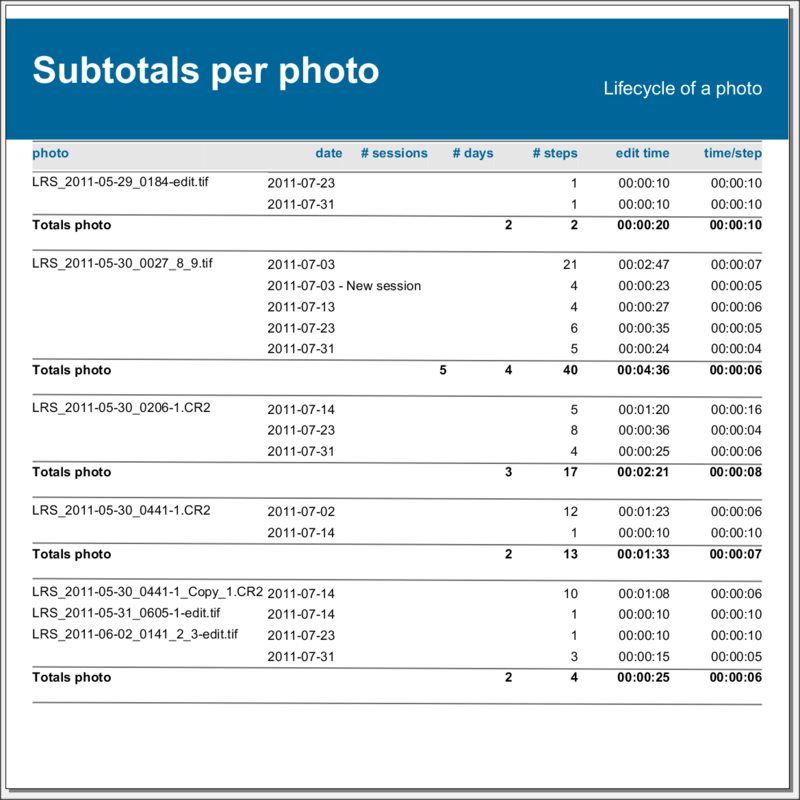 This parameter specifies whether the sub totals section is created or not. Description See description previous parameter. This parameter specifies whether the detail section is created or not. Description This parameter specifies the period between 2 subsequent adjustments when a new editing session should be created, in order to obtain meaningful results. See the miscellaneous tab for more info. Description The time between 2 adjustments is calculated by subtracting the times. However this cannot be done for the first step. This parameter specifies a default time needed for the first develop step. Format Whole value. Not as a time. Description When the time between 2 adjustments is more than the specified seconds the line is colored orange. Description When the time between 2 adjustments is more than the specified seconds the line is colored red. Description The hour rate of the editor. 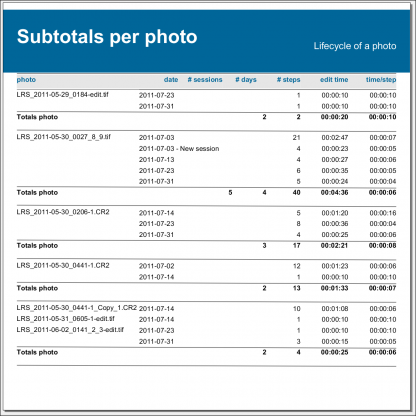 This parameter is used to calculate the estimated costs of the develop work on the selected photos. Format Number, may have decimals. Description Limit the size (number of pages) of the report.To protect the user from creating huge reports that take very long to run default the report is limited to approximately 1000 pages. You can alter this number. A bigger number will result in a bigger report that will take more resources and will take (much) longer to run.Beware: never kill a running report, because this could corrupt the Lightroom catalog.The report is limited by the number of history steps being processed. This number is calculated by multiplying the number of pages of this parameter by 15. On the average between 10 and 20 history steps are printed on a page.By the way, if the report is truncated to the specified limit, a remark is printed below the first summary section. Conditional formatting based on develop time between 2 adjustments, see the last 2 above parameters, further explained below. When were you interrupted? With conditional formatting, if the time between two adjacent adjustments exceeds the value of the “Seconds when conditional formatting orange” parameter the line is written in orange. If it exceeds the value of the “Seconds when conditional formatting red” parameter , then the line is written in red. In this report we introduce the term “Edit Sessions”. The next example explains why we introduced this. Purpose of this report is to list the time you spend editing a photo. But what if you started editing a photo just before your break and then, after half an hour break, you continue and finish your work on this photo. Normally this would result in an edit time of more than half an hour although most of the time you enjoyed your break instead of editing this photo. Of course, that time is not correct because you didn’t work on this photo that long! The parameter “Minutes start new sessions” tells the report that if the time between 2 subsequent adjustments exceeds the value of this parameter then the statistics should be calculated on the adjustments before the break separately from those after the break. A “new edit session” is started. Now you will assess the actual time you spent on this photo.